The town of Himeji has been since long times an important place for the maritime and terrestrial traffic and has developed as a castle and post town. The history of the castle began by the construction of a fort by Governor Akamatsu Norimura of Harima county (Himeji region) in the first year of Genko era (1331). Then, his son, Sadanori transformed it to a castle of his habitation in the 3rd year of Shyohe era (1348). 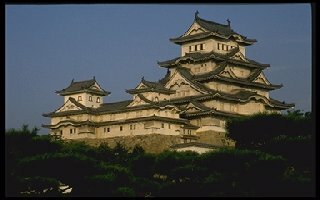 Himeji castle has been chosen first in Japan as a human heritage (of UNESCO). Beginning from the foot of Mt Hime where is located the main tower, the castle draws a great left hand spiral with a threefold moat, and its building plan has been considered one of the most skillful among all the Japanese castles. The main donjon has 5 stages from the outside view but in reality 6 stories above ground and 1 underground. It is supported by 2 wooden pillars with the diameter of nearly 1 meter. Excepting for one pillar of which underground part was replaced during the great repair of Showa Era (1956-1963), virtually all the parts of the castle still keeps the initial construction. Himeji Castle is also called Shirasagi-jo (White Heron Castle) because it looks like a white heron flying with extended wings. An architecture made of one main keep and 3 ancillary towers, with majestic multi-layer roofs, is called "Renritsu-shiki Tenshukaku" (simultaneous tower building). A shrine has been installed at the top floor of the donjon. This shrine, called Nagakabe-jinja, had been the "guardian god" of Mt. Hime-yama where located the donjon. When the castle had been constructed, it was moved outside. Afterward, the people reinstalled it inside because they were afraid of being spelled.